NEW CONSTRUCTION! Gorgeous 4 Bedroom/2.5 Bath Home in this OPEN CONCEPT Plan. Enjoy Spending Quality Time with The Family While in Your Chef's Kitchen with Granite Countertops & Island which is Open to the Family Room with Fireplace. Separate Dining Room & Separate Formal Vaulted Living Room. Hardwood Floors. All 4 Bedrooms are Upstairs along with a Separate Den. Master Suite has Trey Ceiling. 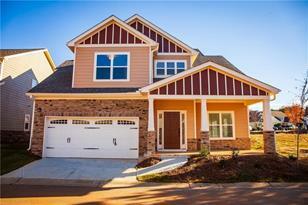 Master Bath has TILE Flooring, Separate Tile Shower, Soaking Tub, Double Vanities and Walk-in Closet. Wonderful Lake Community w/ Clubhouse in Great Location! Driving Directions: 75 South to exit 221 - Jonesboro Rd. Left onto Jonesboro Rd. Right onto Griffin St. 1st Left onto Keys Ferry St. Left onto Society St. Right onto Meeting St. Left onto Best Friends Turn Alley. 462 Best Friends Turn Alley, McDonough, GA 30252 (MLS# 6515431) is a Single Family property with 4 bedrooms, 2 full bathrooms and 1 partial bathroom. 462 Best Friends Turn Alley is currently listed for $229,900 and was received on March 06, 2019. Want to learn more about 462 Best Friends Turn Alley? Do you have questions about finding other Single Family real estate for sale in McDonough? You can browse all McDonough real estate or contact a Coldwell Banker agent to request more information.